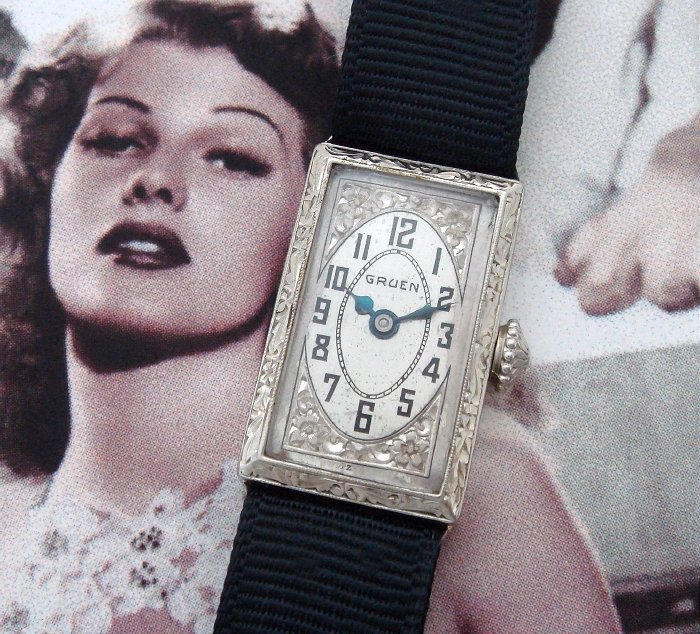 Gruen emerged as one of the pre-eminent watch houses in the United States, producing accurate timepieces in stylish cases that became Jazz-Age darlings. Watch houses sought to outdo one another, carrying the wristwatch as a fashion statement to ever higher levels, but none seemed to touch the panache of Gruen. Founded in the United States in 1876, the legacy of Deitrich Gruen is a benchmark for watch designers to this day. This regal, white gold-filled example of some of Gruen's best work in a ladies watch features an astonishingly original sterling dial with carved outer chapter, blued steel "moderne" hands and matching royal-blue sapphire crown – all as crisp as the day they left the factory. Open the hinged back of this classic 27mm by 15mm watch and you'll find a completely serviced 15 ruby-jewel "Gruen Guild rectangular movement with cut corners — a fancy, high grade movement for a ladies watch of the day. We are happy to custom fit the watch with a correct ribbon. For those of you with the good fortune to have both excellent taste and the means to indulge, this watch would be a spectacular conversation piece at the next club gathering.